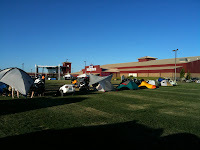 I finally arrived at the BMWMOA rally in Redmond, OR, and I have never seen so many BMW bikes at one time. 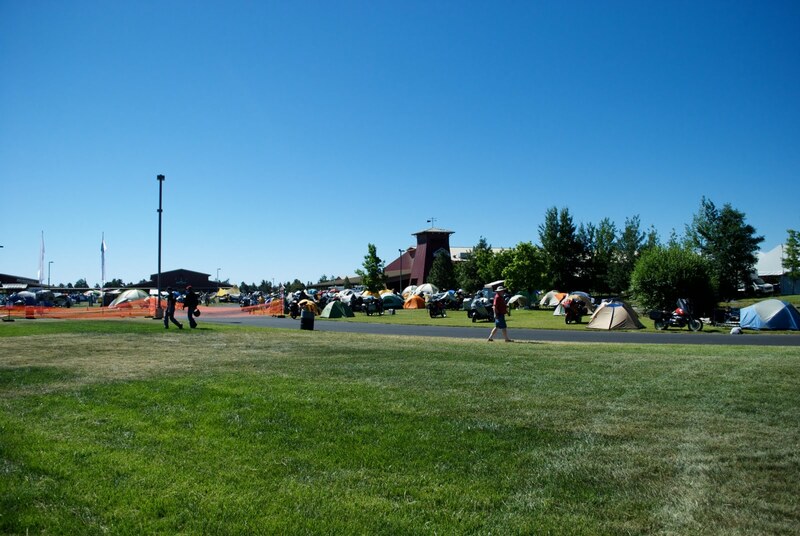 The tent camping area is really nice, smooth and grassy. I can hear the entertainment as the stage is only a few hundred yards away but hopefully it'll be over by 11 or so. The weather is absolutely beautiful without a cloud in the sky. The trip here from Corvallis took a bit longer than I would've expected due to construction and slow moving traffic around Sisters. 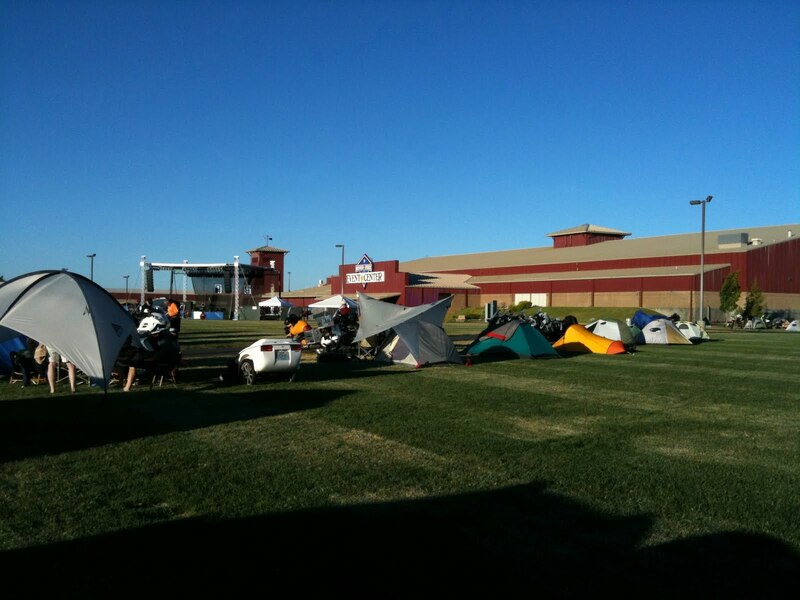 I'm camped near the motorcycle gates and there are lots of bikes coming in but they have all are pretty quiet. No loud pipes in this group. The noisiest thing are the Cushman type vehicles running around carrying stuff around to support the rally. Very few food vendors were open for business today but a few of the farkle vendors were doing a booming business. 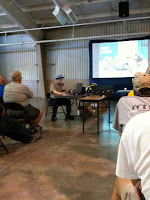 Thursday evening - First thing this morning, I headed over to the BMW tent to sign up for a demo ride. While waiting in line, I was trying to decide between the F650GS and the F800GS. I think the majority of the people were waiting for the S1000RR. I ended up signing up for the F800GS but when my turn came up, there was absolutely no way I could ride that bike. The seat was way to high for me. They switched me to the F650GS and it fit me perfectly. I'm afraid, I could really get used to this bike. Plenty of power compared to my '83 R100RT airhead and much lighter. I inadvertently got in a little "off roading" in when I swung wide on a left turn. Just the kind of handling I've been looking for in the gravel. Very light throttle and brakes and I could barely hear the engine. The only think that took me completely by surprise was the wind pressure on my chest due to the tiny windshield. To me, it felt kind of uncomfortable when our speeds got "up there". Also, my old airhead seemed more comfortable at higher speeds. 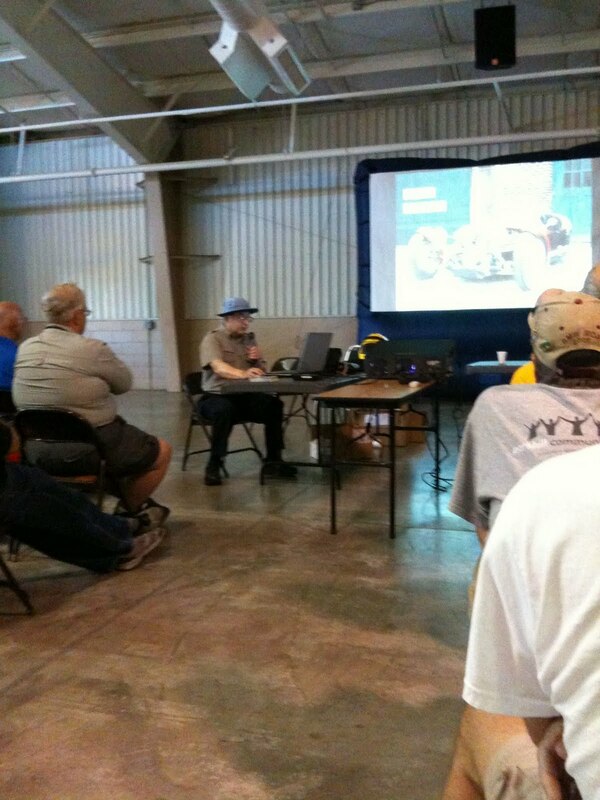 I also attended seminars on cornering, "Why Don't They See Us?" taught by David Hough , and one on perception. There are over a hundred vendors here selling everything under the sun. I'm surprised at the number of people who attend these rallies just to go shopping. I ended the day visiting old friends in Bend whom my wife is staying with. We went to a music in the park event. More "fair food".